Uncertain, possible corruption of Italian girasole articiocco (“sunflower artichoke”), with girasole mistaken for the word Jerusalem via folk etymology. A variety of sunflower, Helianthus tuberosus, native to North America, having yellow flower heads and edible tubers. The tuber of this plant, eaten as a vegetable. 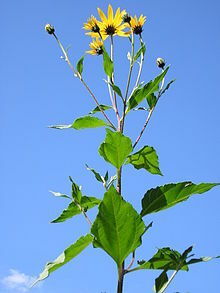 The Jerusalem artichoke (Helianthus tuberosus), also called the sunroot, sunchoke, earth apple or topinambour, is a species of sunflower native to eastern North America, and found from Eastern Canada and Maine west to North Dakota, and south to northern Florida and Texas. 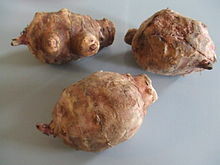 It is also cultivated widely across the temperate zone for its tuber, which is used as a root vegetable.